Hiring? Toptal handpicks top Qt engineers to suit your needs. C++ developers strive to build robust multithreaded Qt applications, but multithreading was never easy with all those race conditions, synchronization, and deadlocks and livelocks. To your credit, you don’t give up and find yourself scouring StackOverflow. Nevertheless, picking the right and working solution from a dozen different answers is fairly non-trivial, especially given that each solution comes with its own drawbacks. Multithreading is a widespread programming and execution model that allows multiple threads to exist within the context of one process. These threads share the process’ resources but are able to execute independently. The threaded programming model provides developers with a useful abstraction of concurrent execution. Multithreading can also be applied to one process to enable parallel execution on a multiprocessing system.. The goal of this article is to aggregate the essential knowledge about concurrent programming with the Qt framework, specifically the most misunderstood topics. A reader is expected to have previous background in Qt and C++ to understand the content. Tasks that don’t need the event loop. Specifically, the tasks that are not using signal/slot mechanism during the task execution. Use: QtConcurrent and QThreadPool + QRunnable. Tasks that use signal/slots and therefore need the event loop. Use: Worker objects moved to + QThread. Try to avoid such “workarounds”, though, because these are dangerous and not efficient: if one of the threads from thread pool (running MyTask) is blocked due to waiting for a signal, then it cannot execute other tasks form the pool. You can also run a QThread without any event loop by overriding QThread::run() method and this is perfectly fine as long as you know what you are doing. For example, do not expect method quit() to work in such case. Imagine you need to ensure that only one task instance at a time can be executed and all pending requests to run the same task are waiting on a certain queue. This is often needed when a task is accessing an exclusive resource, such as writing to the same file or sending packets using TCP socket. Let’s forget about computer science and producer-consumer pattern for a moment and consider something trivial; something that can be easily found in real projects. A naïve solution to this problem could be using a QMutex. Inside the task function, you could simply acquire the mutex effectively serializing all threads attempting to run the task. This would guarantee that only one thread at a time could be running the function. However, this solution impacts the performance by introducing high contention problem because all those threads would be blocked (on the mutex) before they can proceed. If you have many threads actively using such a task and doing some useful job in between, then all these threads will be just sleeping most of the time. QMutexLocker locker(& lock);   // high contention! This solution has one benefit: QThreadPool::clear() allows you to instantly cancel all pending requests, for example when your application needs to shut down quickly. 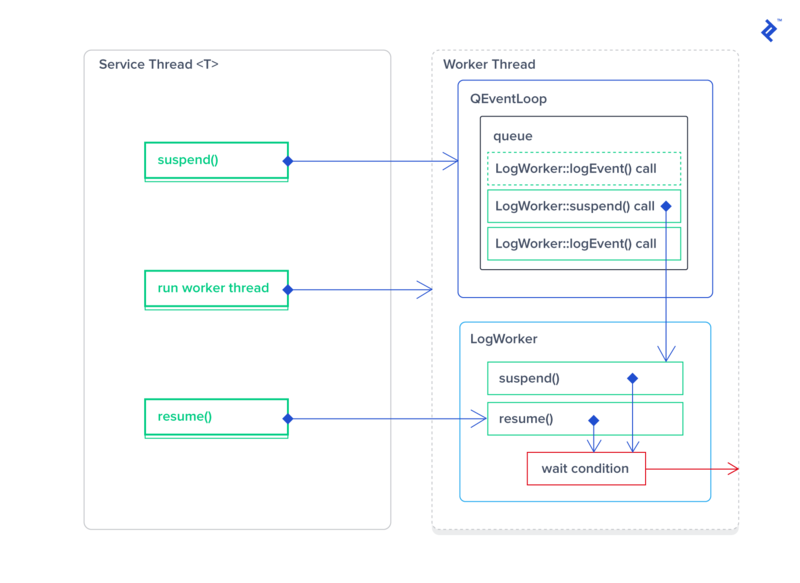 However, there is also a significant drawback that is connected to thread-affinity: logEventCore function will be likely executing in different threads from call to call. And we know Qt has some classes that require thread-affinity: QTimer, QTcpSocket and possibly some others. What Qt spec says about thread-affinity: timers started in one thread, cannot be stopped from another thread. And only the thread owning a socket instance can use this socket. This implies that you must stop any running timers in the thread that started them and you must call QTcpSocket::close() in the thread owning the socket. Both examples are usually executed in destructors. The better solution relies on using QEventLoop provided by QThread. 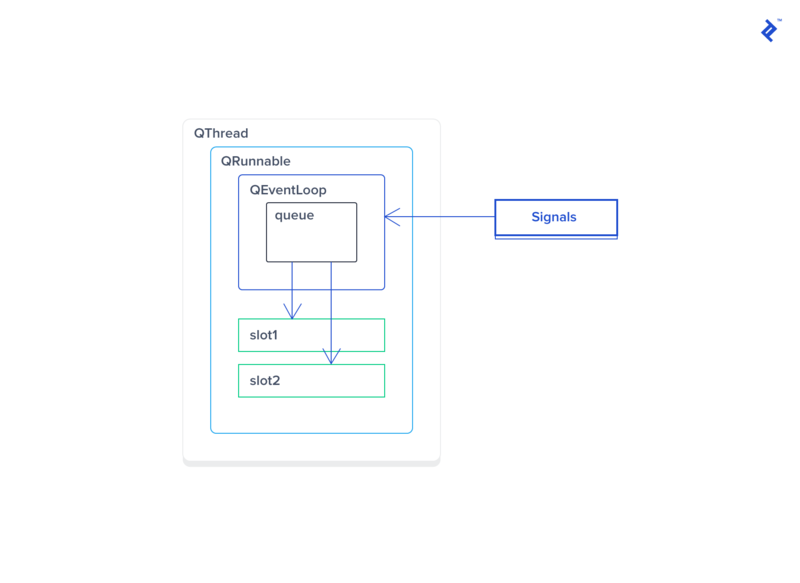 The idea is simple: we use a signal/slot mechanism to issue requests, and the event loop running inside the thread will serve as a queue allowing just one slot at a time to be executed. In the constructor, we create a thread and worker instance. Notice that the worker does not receive a parent, because it will be moved to the new thread. Because of this, Qt won’t be able to release the worker’s memory automatically, and therefore, we need to do this by connecting QThread::finished signal to deleteLater slot. 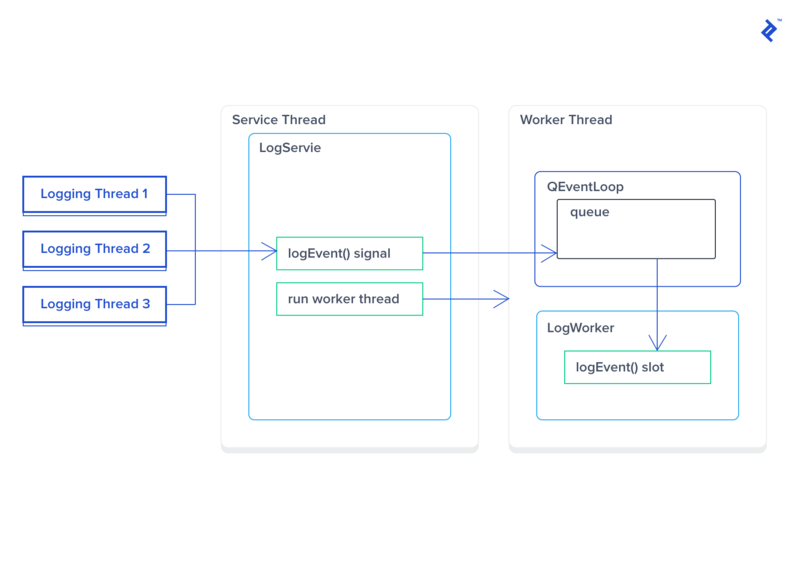 We also connect the proxy method LogService::logEvent() to LogWorker::logEvent() which will be using Qt::QueuedConnection mode because of different threads. In the destructor, we put the quit event into the event loop’s queue. This event will be handled after all other events are handled. For example, if we have made hundreds of logEvent() calls just prior to the destructor call, the logger will handle them all before it fetches the quit event. This takes time, of course, so we must wait() until the event loop exits. It is worth mentioniong that all future logging requests posted after the quit event will never be processed. The logging itself (LogWorker::logEvent) will always be done in the same thread, therefore this approach is working well for classes requiring thread-affinity. At the same time, LogWorker constructor and destructor are executed in the main thread (specifically the thread LogService is running in), and therefore, you need to be very careful about what code you are running there. Specifically, do not stop timers or use sockets in the worker’s destructor unless you could be running the destructor in the same thread! We made LogService to be the QThread object because we needed to implement the custom run() function. We used private subclassing to prevent accessing QThread’s functions since we want to control thread’s lifecycle internally. In Thread::run() function we run the event loop by calling the default QThread::run() implementation, and destroy the worker instance right after the event loop has quit. Note that the worker’s destructor is executed in the same thread. LogService::logEvent() is the proxy function (signal) that will post the logging event to the thread’s event queue. Another interesting opportunity is to be able to suspend and resume our custom threads. Imagine your application is doing some processing that needs to be suspended when the application gets minimized, locked, or just has lost the network connection. This can be achieved by building a custom asynchronous queue that will hold all pending requests until the worker is resumed. However, since we are looking for easiest solutions, we will be using (again) the event loop’s queue for the same purpose. suspend() would be a blocking call that sets the thread waiting on a waiting condition. This would be done by posting a suspend request into the queue and waiting until it is handled. Pretty much similar to QThread::quit() + wait(). resume() would signal the wait condition to wake the sleeping thread up to continue its execution. // resume() must be called from the outer thread. // suspend() must be called from the outer thread. // the worker thread is suspended. Remember that a suspended thread will never receive a quit event. For this reason, we cannot use this safely with vanilla QThread unless we resume the thread before posting quit. Let’s integrate this into our custom Thread<T> template to make it bulletproof. With these changes, we will resume the thread before posting the quit event. Also, Thread<TWorker> still allows any kind of worker to be passed in regardless if it is a SuspendableWorker or not. // "queued event" is now processed. This is a commonly misunderstood topic. Most people believe that volatile variables can be used to serve certain flags accessed by multiple threads and that this preserves from data race conditions. That is false, and QAtomic* classes (or std::atomic) must be used for this purpose. // this is not thread-safe! In this article, we discussed several important concerns about concurrent programming with the Qt framework and designed solutions to address specific use cases. We have not considered many of the simple topics such as using of atomic primitives, read-write locks, and many others, but if you are interested in these, leave your comment below and ask for such a tutorial. If you’re interested in exploring Qmake, I also recently published The Vital Guide to Qmake. It’s a great read! This multithreading model provides developers with a useful abstraction for concurrent execution. However, it really shines when applied to a single process: enabling parallel execution on a multiprocessor system. Multithreading is a programming and execution model that allows multiple threads to exist within the context of a single process. These threads share the process' resources but are able to execute independently. What is a Qt application? An application that is built with Qt framework. Qt applications are often built with C++ because the framework itself is built with C++. However, there are other language bindings such as Python-Qt. What concurrent models are supported by Qt? Task based concurrency by leveraging of QThreadPool and QRunnable, and threads programming by using QThread class. What synchronization primitives are available for Qt developers? The most frequently used are QMutex, QSemaphore, and QReadWriteLock. There are also lock-free atomic operations provided by QAtomic* classes.